Moving on, since I already gave a brief description of poriyal earlier, I will not go into it again. This simple type of curry is something I often turn to when I am making south Indian style lunches/ dinners. In the past I have posted this carrot with mung lentil poriyal and this cauliflower potato poriyal here. My mother in law favors this combination of cabbage and cauliflower and I picked up the idea of using this combination from her. If you are looking for a quick and simple curry to go with your rasam or sambar you may want to consider this curry. It also works very well with rotis/ Indian flatbread/phulkas. a little extra salt and turmeric powder for soaking the cauliflower florets. In a large heavy bottomed pan fill water as required that will submerge the cauliflower florets entirely. Place on heat and allow to come to a full boil. Add 1/2 tsp salt and a pinch of turmeric powder. Add cauliflower florets and allow the water to simmer for a couple of minutes. Remove from heat and drain the water.Keep the cauliflower florets aside. The idea is to semi cook the florets just a little at this point to ensure even cooking when added with other vegetables. In the same pan heat oil, add mustard seeds to it. When the mustard seeds splutter, add split black gram lentil(udad dhal) and stir until it turns reddish. Quickly add a pinch of asafoetida powder and broken red chili and stir a couple of times. Add turmeric powder, mix once, then add cabbage, cauliflower, green peas and mix well. Add salt to taste, mix well and cover the pan with a lid and allow the vegetables to cook on low to medium low heat without adding any water. Keep an eye on it, if absolutely required sprinkle a few drops of water. I usually never need any additional water for this curry. Finally when the vegetables are cooked, add red chili powder if you plan to use it, and garnish with grated coconut. 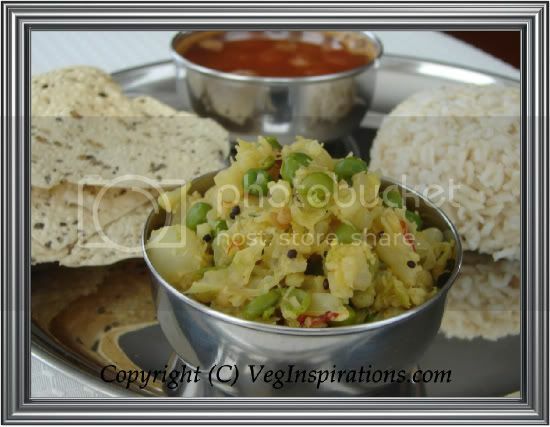 Mix well and serve hot with some plain steamed rice and some sambar or rasam.